(Washington, D.C.) – This summer, elementary, middle and high school teachers from around the nation are invited to Nashville, Tenn., to take part in the Civil War Trust’s annual Teacher Institute. The two-day summit will offer educators an opportunity to meet and discuss the successful tactics they employ in their classrooms, as well as participate in workshops and attend lectures by top historians. The tenth annual Civil War Trust Teacher Institute will be held July 15–16, 2011, in Nashville, Tenn., with scheduled speakers Dr. Caroll Van West, director of the Center for Historic Preservation at Middle Tennessee State University, best-selling historical novelist Robert Hicks and historian Eric Jacobson. Interested attendees also have the option to register for a unique pre-conference workshop focusing on techniques for teaching Civil War history with 21st century technology to be held on Thursday July 14. Workshop sessions for this year’s institute include: The War in the West – An Overview, Using Photography from the Library of Congress in the Classroom, and 21st Century Technology and the Civil War — plus a special session focusing on the Trust’s new Civil War Curriculum. On Saturday, teachers will travel to the Franklin and Stone’s River Battlefields, to learn techniques that will help students maximize their field trip experiences. Attendees also have the ability to register separately for a second day of touring on Sunday July 17, when then can explore other Nashville-area sites like Belle Meade Plantation, Travellers Rest Plantation and Fort Negley. Participation in this exciting event is limited to 200 K-12 educators. The Teacher Institute is offered free of charge, but teachers are required to hold basic membership in the Civil War Trust. Due to space limitations, a $100 deposit is due at registration; following the event, this fee may either be refunded or donated toward land preservation efforts. Additional fees apply to optional pre- and post-Institute events. Educators or their school districts must pay for lodging and transportation to the event, but scholarships and stipends are available to help defray these costs. For more information, please visit www.civilwar.org/teacherinstitute. The Civil War Trust is the largest nonprofit battlefield preservation organization in the United States. Its mission is to preserve our nation’s endangered Civil War battlefields and to promote appreciation of these hallowed grounds. To date, the Trust has preserved more than 30,000 acres of battlefield land in 20 states. Learn more at www.civilwar.org. The American Civil War is a touchy subject for educators, who must help children understand issues that continue to divide Americans 150 years after the war’s outset. You don’t have to look far for examples of how the Civil War stirs public debate 150 years after it began. A private “secession ball” in Charleston, S.C., pegged to the anniversary in February of the state’s declared exit from the Union, sparked a protest from the local NAACP chapter. In Virginia, Gov. Robert F. McDonnell, a Republican, got into trouble last year for issuing a proclamation on Confederate History Month without ever mentioning slavery. Experts say schools can play a powerful role—and hold an important responsibility—in helping young people make sense of a complex conflict whose meaning continues to be hotly disputed in the public sphere. That debate is sure to be amplified, given the prominent attention the war is getting as the sesquicentennial begins this month. Think you know your Civil War history? Take our quiz! Recent polling suggests that Americans remain divided in their views of issues tied to the Civil War. The very idea of designating a Confederate History Month, for instance, which Gov. McDonnell’s two Democratic predecessors declined to do, split those surveyed. Just more than half of U.S. adults said they oppose such a remembrance, according to the poll by Harris Interactive. To be sure, the nation has come a long way. For decades, historians say, slavery had been largely removed from the public conversation about the war and its origins, as had such topics as the role of African-Americans in fighting for the Union. Today, they get much more attention in schools, museums, and planned commemorations of the anniversary. Most mainstream historians now agree that slavery was the leading reason driving the conflict. That said, Mr. Robertson and others stress that it was by no means the only factor propelling the war, which involved a web of issues, including differences in the Northern and Southern economies, and disputes over the nature of the Union, the role of the federal government, and states’ rights. History educators say one of the biggest challenges for schools in promoting an accurate and deep understanding of the conflict may well be time. At the secondary level, the topic may be part of a yearlong course that covers the full sweep of American history; a lucky teacher might get two years. A fundamental understanding of the Civil War is widely seen by historians and history educators as vital for Americans. They call it a defining moment in U.S. history that still has many ramifications and lessons a century and a half later. “But it’s not just that,” he said, citing, for instance, states’ rights. And how schools teach the Civil War flares up from time to time. One recent example concerned a textbook on Virginia history found in many of that state’s public elementary schools. It came under fire last fall, after a parent complained about the book’s contention, widely disputed by historians, that thousands of blacks served as soldiers for the Confederacy. A review by a panel of historians of Our Virginia: Past and Present and another text from the same publisher, Five Fronds Press, led the state board of education last month to withdraw approval of both and to overhaul its textbook-review process. When asked whether current teaching on the war reveals regional biases, most history educators interviewed said that if there are differences, they are far more rare than in the past, and less pronounced. “I definitely have sat in on a classroom or two that maybe shocked me with an old school, Old South version of the Civil War or the causes,” said Donald Stewart, the project director for a grant in South Carolina under the federal Teaching American History program. But he said that, in his experience, this is the rare exception. “I’m still waiting to come across the teacher … who believes that slavery was a side issue [in the Civil War],” said Paul C. Anderson, an associate professor of history at Clemson University, in South Carolina, who also has worked with many K-12 educators. “I have the exact opposite problem. If I get a question, it’s that a teacher considers the war to be a moral crusade [by the North], and it was not that way. Meanwhile, Kimberley Warrick, a curriculum specialist for a set of Georgia school districts and a former history teacher in Montana and Ohio, said she’s encountered that mind-set. She said she has perceived some misconceptions from teachers and students who don’t live in the South, including that all whites in the antebellum South owned plantations and slaves, and that all Southern whites were, and still are, racist. “I believe some students may have these misconceptions because time typically does not allow teachers to explore many of the issues deeply,” she said. In Hartford, Vt., Jennifer Boeri-Boyce, who teaches social studies at Hartford Memorial Middle School, said she tries to help students get past the stereotypes. Indeed, historians caution against assuming that Union soldiers were typically motivated by a desire to liberate slaves. Analysts say textbooks generally do a reasonable job of providing a fair and accurate look at the Civil War, though that was not always so. But he doesn’t see such differences in textbooks now. “They usually do a pretty good job of laying out the arguments as to what may have caused the war, and the major issues,” Mr. Ward said. Gilbert T. Sewall, the director of the American Textbook Council, a nonprofit research group based in New York City, echoes that sentiment. “Happily, the Civil War is an area of American history that is not only covered in depth, but is covered adequately or better,” he said. State standards provide some indication of how schools teach the war, though one analyst suggests that in many places they offer little, if any, guidance. “Apart from mentioning in passing that the Civil War happened, that’s about all you get in many states, regardless of region,” said Jeremy A. Stern, a history scholar who co-wrote a recent reportby the Washington-based Thomas B. Fordham Institute that graded state history standards. He sees little evidence of regional variations in the thrust of Civil War content in states that do get more specific, though he said Southern states are generally more apt to talk about the Civil War in state-history courses, given its impact there. He added: “There are a number of Southern states that are notably honest in dealing with the realities of slavery and … the coming of the Civil War.” He cited Alabama, South Carolina, and Virginia as examples. But Mr. Stern singled out another former Confederate state for criticism. He notes, for example, that sectionalism and states’ rights are listed as causes of the war before slavery, the third item in a list in the Texas standards, which were revised last year. The Texas board, led by a block of staunch conservatives, stirred national controversy with its extensive set of changes to the state’s social studies standards. Another Civil War issue that arose concerned Confederate President Jefferson Davis. 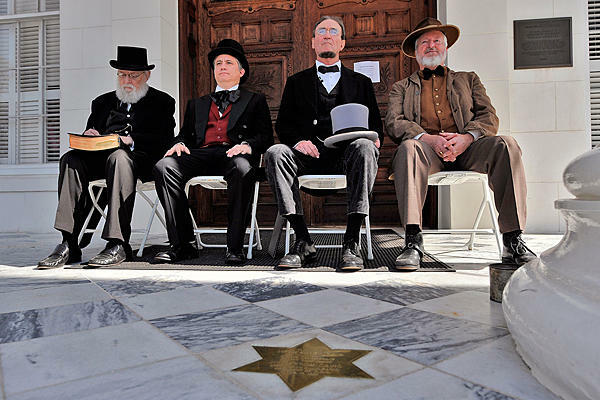 The board added new language saying students should examine Davis’ inaugural address alongside President Abraham Lincoln’s first and second inaugural addresses, as well as the Gettysburg Address.